What is your address and how to get there? 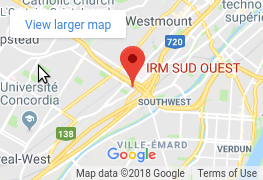 5515 Rue St-Jacques Ouest Bureau 200, on the corner of St-Jacques and Girouard, accessible by car and metro → 10 min walk away from metro Vendome. How long will it take to get the results/report? The reports will be ready 2 to 4 working days following the exam. Can the report be sent to me or to another doctor? It is sent directly to the referring physician who will contact the patient directly and if needed, the report can be sent to any other doctor they would like. How to book a general ultrasound? 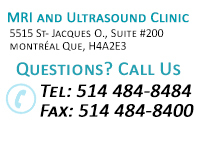 For general ultrasounds, we can give an appointment right away over the phone. Are ultrasounds covered by the RAMQ? Yes. It is free covered by Medicare. How long does it take to get an appointment for ultrasounds? We can give an appointment right away over the phone. How long is the ultrasound exam? The exam itself takes approximately 15 minutes. What type of exams do we do here? General ultrasounds including but not limited to breast, abdominal, pelvic, endovaginal, testicular, venous doppler; Musculoskeletal ultrasounds for all joints, with or without injections (infiltration, lavage calcique, arthrodistension); and most MRI exams. How to book an appointment for MSK ultrasounds? To book an appointment, the patient or the referring physician must send us the requisition either by fax or by email and we will contact them as soon as possible with an appointment time and date. How long is the wait for an MSK ultrasound appointment? The wait for an MSK is longer as the exam has to be done by a radiologist. Is the ultrasound with infiltration/lavage calcique/arthrodistensive covered by the RAMQ? It is completely FREE and covered by Medicare. How long is the MSK ultrasound exam? How to book an appointment for MRI? For an MRI appointment, patient or referring physician must send the requisition either by fax or by email, we will then contact the patient as soon as possible for an appointment time and date. What do you need to get an MRI appointment? It takes 24 to 48 hours to book an MRI; the patient must have a referral in order to get an MRI. Do we work with CSST/SAAQ /Private Insurances? Since we are a private clinic, these exams are not covered by Medicare; depending on the region and type of exam, the prices may vary, it is around $670. For patients from the CSST, SAAQ it is free, it is 100% covered by these agencies. For private insurance patients, it is covered between 80%-100% depending on the plan, we will provide a receipt so that it can be reclaimed by their insurance.